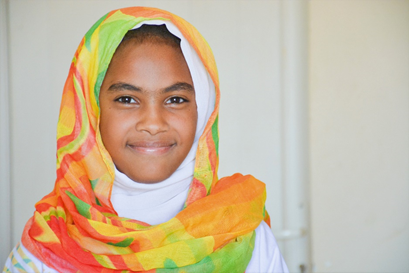 Reem Mohammed Ali is a 12-year old girl from Al Gezira state in Sudan, who unwittingly commands attention with enough confidence that fills an entire room. As we sat down together during a UNICEF Sudan field mission to Rufaa in Al Gezira, it was clear from the get go that this young lady had enough authority and self-assuredness to claim her place in society. Our memorable conversation then, began to get even more interesting. Our encounter took place on the sidelines of the graduation ceremony marking the end of the Training of Teachers workshop in East Gezira locality for 2018, under the Saleema campaign to end FGM and Child Marriage. Saleema (as God created her), is led by the National Council for Child Welfare and supported by UNICEF, with aid from the UK Department for International Development. The objective is to also change the negative connotations associated with girls who are not cut. Reem, is part of the Girls Club, a programme which falls under Saleema, and is open to youngsters between the 1st and 7th grades. Through this safe learning environment, girls are taught about their rights and how they can create positive change. They also engage in creative activities including drawing, writing and design. “I joined the Girls Club this year. The first thing I learned about is FGM and Child Marriage and the negative impact on us. We also learned about handicraft, and this is what liked the most,” said Reem. In 2018 alone, UNICEF Sudan supported the establishment of 323 Girls’ Clubs in Sharg El Gazira and Ummalkura localities in El Gazira state, and at least 623 teachers were trained. Reem has one younger sister who is 9 years old, and a member of the Girls’ Club. Reem proudly told us about how her community is now FGM free. Through the Girls’ Club, Reem and her sister were also equipped with knowledge of the physical dangers of FGM and how, in many cases, it can be the root cause of diseases such as Tetanus and can create difficult child birth. According to the state Ministry of Health, Sudan has one of the highest rates of women’s mortality during child birth — FGM is a major factor. “I will not cut my daughters because I believe that by then, FGM will be abandoned everywhere in Sudan,”  said Reem. When it comes to Child Marriage, the young advocate explained that if someone in her community wants to marry, the local Religious leader will ask first about her age to ensure the female is not a child. “Early marriage is a bad habit because a little girl cannot take the responsibility of a home and kids. I will tell people to stop it as much as I can,” said Reem. Through the UNICEF-supported Saleema campaign, boys are not forgotten either. With partners, advocacy efforts to ensure young boys are not married before the age of 18, and are included in the conversation, are ongoing. They too are interested in learning how they can best protect female family and community members.